M132 | 1003 m. | 3291 ft.
2016 Sgurr Mor is a rather isolated hill usually climbed by itself. Unless of course you are an ultra-fit hillwalker as my friend Frank is who had bagged the hill as a moderately exhausting minor extension to our memorable Sgurr na Ciche, Garbh Chioch Mhor and Sgurr nan Coireachan hike a few years ago. This feat of his had left me with a sore spot in my record that called for me making amends. Fortunately, Frank had agreed to accompany me on my attempt to climb Sgurr Mor in a one-hill-expedition from Strathan in 2016. So a nice day in June 2016 saw us drive down the uuunnnndulating road on the north side of Glen Arkaig towards the parking at the end of the loch. From Strathan we continued on the track towards Glen Dessary Lodge. A few minutes before reaching the lodge we climbed the easy path up to the long and wide beallach (at about 360m) between Druim a’ Chuirn and Fraoch Bheinn. From there we moved towards Glen Kingie skirting the north east ridge of Druim aí Chuirn and heading towards the path alongside the developing River Kingie. On the way we paused sitting in the long grass. When the path beside the River Kingie was reached we turned due west and followed it all the way to the Sgurr Mor ridge above. On the ascent the well-engineered path zigzags up the southern flank of An Eag and Sgurr Beag very nicely. We gained altitude in a steady fashion. Once on the ridge and west of Sgurr Beag we rested and ate some of our sandwiches. Another hiker — the only other one that day — was visible climbing Sgurr Mor. We lost sight of him in the mist later. From the beallach between Sgurr Beag and Sgurr Mor we climbed the path that leads up to the summit of the “big hill”. We followed it towards the rocky summit of Sgurr Mor. Needless to say that we were engulfed in thick clouds and that the rain was beating down upon us when we attained the summit. We touched the cairn and continued down the steep and rocky southeast ridge of the hill. Further along the ridge became grassy and after we had left the mist and clouds behind we reached the beallach between Sgurr Mor and Sgurr an Fhuarain. From there we descended increasingly steep grass slopes in south-south-westerly direction towards Glen Kingie. Once on the floor of the glen we directed our steps back due south up another 150metres of ascent towards the beallach between Druim a’ Chuirn and Fraoch Bheinn. For me this final climb of the day was a slog whereas Frank seemed to have energy to spare. Anyway, once at the beallach we strolled back towards Glen Dessary Lodge, picking up a bottle of water deposited on the way out, and headed back towards Strathan along the Landrover track in Glen Dessary. Sgurr Mor is a rather remote hill and requires a lot of effort for barely one tick in the list. However, it is a great hill and the expedition into the remote and wild Glen Kingie is very much worth the while. I would do this hike again any time! 2010 Frank’s story: Sgurr na Ciche and his neighbours were Munros which we wanted to climbed for years now but there was never the right time. This year it was. We woke up at 6 am enjoyed an extensive breakfast and packed our stuff. Then we drove one of the most torterous single tracks roads in Scotland i have ever driven. The track along Loch Arkaig is a hell of a road. Finally we reached Strahan and prepared ourselves for a really long day. The walk through Glen Dessarry is a really nice one, although the forestation to the west is not especially eyecandy. We had decided that we won’t follow the recommandations from SMC and McNeish and everyone else. Instead we aimed to climb Sgurr na Ciche first and then his easterly neighbours with the remote Sgurr Mor as the final and 4th Munro. On the way through the Glen we passed Dessarry House – a very remote and a very huge sporting lodge. The paths continued and we left it after aprox 9 km’s and headed up the bealach. The gorge we saw was a surprise, didn’t read anything about that. But there it was and we had to climb that steep and wet rock thing. Soon after that the bealach was reached and we traced our steps towards the summit of this very recognisable Munro. This ascent is in fact much steeper than that through the gorge and we had to descent it after taking a well earned lunch break on Sgurr na Ciche. Almost at the same height the next summit Garbh Cioch Mhor waited for us after a steep and very direct pull. In no time we were there. What was going to follow was a not so funny up and down of tops and Munros which Cord ended on the 3rd Munro of the day – Sgurr nan Coireachan – he returned then the normal way down to Glen Dessarry. I felt good enough to gave the 6 km remote Sgurr Mor a try. Another solo. Always exciting. Cord’s story: This is the tour Frank and I had been planning to do for a longer time than any other hillwalk in Scotland apart maybe from the Five Sisters of Kintail which had also been on our agenda for quite a while before we made them. But then, after having driven the car about 20 odd miles along the undulating single track road on north shore of Loch Arkaig we finally arrived at Strathan. 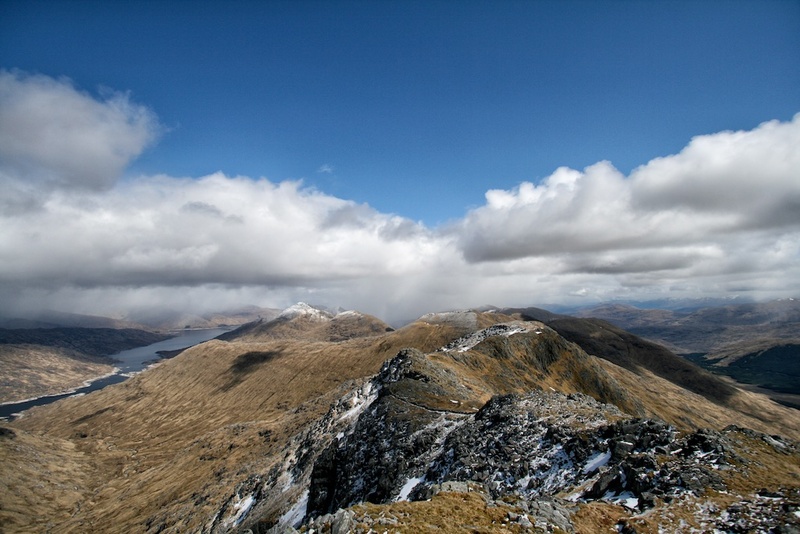 We packed our rucksacks, laced our boots and off we went for this much coveted Munro adventure. It was quite cold that morning when we set out on the track to Glendessarry. Progress was easy and in no time Glendessarry House – a really massive lodge – and Upper Glendessary were reached. There we left the Landrover track and continued on the path which runs along the north side of the massive pine plantation in the glen. After about 9 or 10 kilometres we started climbing up a grassy track in order to gain height and to finally reach the deep gully which separates Garbh Cioch Mor and Sgurr na Ciche. We finally reached this narrow and deep gash in the mountains’ south side and steadily climbed the gully over boulders and lingering spring snow fields. Where the gully opens up a bit and levels out below the Feadan na Ciche we paused for a snack. It was there when we met an English hillwalker who should be our on and off companion for the rest of the day. We chatted a bit and went on. From the Feadan na Ciche col we followed the increasingly steep path through crags and boulders to the summit ridge of Sgurr na Ciche. A very nice scramble in places. Soon the summit was reached and we took a well-deserved break enjoying the clear views of Knoydart with Loch Nevis, Meall Buidhe, Luinne Bheinn and Ladhar Bheinn offering much to be marvelled at and to be remembered – Ladhar Bheinn had been one of the first Munros we had climbed in 1993! Oh, how time flies by! After some twenty minutes on the cold summit we retraced our steps to the Feadan and climbed the rocky and interesting west ridge of Garbh Chioch Mor to the summit of the second Munro of the day. From there we walked along the rocky and knobbly ridge to Garbh Chioch Beag and further on to the col which separates Garbh Chioch Beag from Sgurr nan Coireachan. I needed a break so we rested for a short while on the grass in fine sunshine. Then we tackled the final 220 or so metres up the west ridge of Sgurr nan Coireachan on a steep but otherwise easy path. At the summit of Munro no. 3 of the day I more or less collapsed since my batteries had run empty. Frank, however, was still energetic so we decided to split up our little group of two. Frank went on another four or five kilometres to Sgurr Mor in the company of our English companion. I returned to Glen Dessarry via the grassy and pleasantly sunny south ridge of Sgurr nan Coireachan after a nice break dozing in the sunshine at the summit. I reached the Glen at the spot where the Allt Coire nan Uth crosses the path we had walked upon on the way out. For me it was back to Strathan then on known paths and Landrover tracks. I reached the car about ten and a half hours after we had started the expedition. Frank returned to Strathan via Sgurr Mor, the Doire nan Cluainean side of the hill, the headwaters of the River Kingie, the boggy col between Glen Kingie and Glen Dessarry, and then Glen Dessarry House where he finally rejoined the Landrover track which delivered him back to the car after more than 35km and about 12 hours of walking. Description As its name suggests, Sgurr Mor is a big mountain. It dominates the south side of Loch Quoich, and is the central and highest peak of the range between Loch Quoich and Glen Kingie which starts with Gairich and ends 10 kilometres to the west at Sgurr nan Coireachan. The most direct approach to Sgurr Mor is by boat or canoe across Loch Quoich, but this pleasure is not possible for everyone, so a longer way has to be found. The route from the end of the public road near the head of Loch Arkaig is the most usual choice, but parking a car at that point is often a problem.Proceed on foot along the private road to Glendessarry lodge and take the stalker's path north over a pass, with Sgurr Mor directly ahead, to reach the upper reaches of the River Kingie. The next part of the route depends on whether or not the river is safely crossable. If it is, cross it and climb north up a long and steep slope 500 metres high to reach the col south-east of Sgurr Mor. Continue along a path up the ridge to the summit. If the River Kingie is in spate, go up the south bank until it is possible to cross and make use of the stalker's path on the north side to reach the ridge between An Eag and Sgurr Beag, and continue along this path to Sgurr Mor.